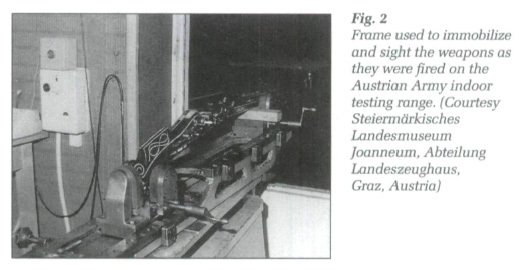 In our last post, we looked at a series of penetration tests done in Graz, Austria, to weapons from the 16th, 17th and 18th centuries, compared to modern weapons. But what about accuracy, the reader asks? Today, we will study the accuracy of those ancient weapons against modern weapons. Results of accuracy tests. Click on the image to enlarge. The height and width refer to the dimensions of the smallest rectangle that could be drawn around all the bullet holes. The next column is the area of the this rectangle. The last column is the probability that the primary target was hit at all. In keeping with the spirit of the original tests, results are in metric units. To convert cm. to inches, multiply the numbers by 0.3937. To convert the area from sq. cm to sq. inches, multiply the numbers by 0.155. To eliminate human inaccuracy, all weapons were fired from a frame and triggered electronically, bypassing their normal firing mechanisms. Muskets and rifles were tested on targets at 100 meter (330 feet) distance, whereas pistols were tested on targets at 30 meter (100 feet) distance. The flintlock barrel that was used as a pressure tester, was not fired at targets for these tests, therefore it shows up in the chart with green background and the words "no applicable data". The wheellock musket made in Southern Germany in the first half of the 17th century shot so inaccurately, that the tests for it were cancelled. This is shown in the chart with pink background and the words "Tests cancelled due to excessive scatter". The three best performing ancient weapons are highlighted in gray background. As can be seen from the above figures, long-barreled weapons performed very poorly in the accuracy tests. Only one musket (The 9th weapon - flintlock musket from Austria, made in the second half of the 18th century) showed any good probability of hitting the target (83%). Not surprisingly, this happened to be a rifled barrel. However, two other rifled weapons (the 1st one and the 6th one) performed really badly. In fact, the 6th weapon (the wheellock musket, South German, from the first half of the 17th century) scattered its shots so badly that the test was cancelled for it. For 4 out of the 13 guns tested, the enclosing rectangle's area was larger than the area of the primary target, and for 2 others, it was nearly the area of the primary target. This means that a total of 6 of the 13 long guns shot so inaccurately at 100 meter distances, that they only hit their targets by pure random luck! This is why battlefield commanders of the 16th-18th centuries ordered their troops to shoot at smaller distances, such as 50-70 meters (160 to 230 feet) or even closer than that, in order to be effective. One of the primary reasons for inaccuracy of the ancient firearms is the shape of the bullet, which is a round ball. At distances of 100 meters, the Magnus effect, which we studied earlier, plays a significant role in the ball deviating away from the target. By contrast, modern bullets are tapered and are more stable when flying in the air. On the other hand, the two ancient pistols fared much better at 30 meter ranges. While they had much larger enclosing areas than the modern pistol, they did manage to put most of their shots into the human-sized target. In fact, one of the two ancient pistols had a 99% probability of hitting its target. Therefore, at closer distances that pistols were used at, they could be pretty deadly. At closer distances, the deviation caused by the Magnus effect is not large enough to cause the ball to miss its target. This explains the number of injuries and deaths in pistol duels, as well as the effectiveness of pistol cavalry units, such as the German Reiters troops. Of course modern weapons are far more accurate - that's what centuries of development will do for you. 1) Rifled weapons from the 16th and 17th centuries were in no way mass-produced - nor were they "muskets." As specialized weapons they were made to shoot a particular size ball, patch, and powder charge, and the results will vary widely, depending on the load (including the granulation and type of gunpowder used). It's possible that the accuracy of the 9th weapon or the inaccuracy of the 6th weapon -the German Wheellock- is due far more to the load used than to the inherent accuracy or inaccuracy of the weapon itself with ideal loads. 2) Smoothbore military weapons of the 16th-18th centuries were generally designed not to hit a particular man at 100 meters, but to hit masses of men at an extreme distance of 70-100 yds. If I aim at one soldier, but hit the man next to him, that is usually success on the battlefield. 3) A pistol fired from a rest is far more accurate than one fired from a trotting horse. At 30 meters I'd much rather take my chances of my opponent missing from horseback with a pistol than if he were on foot with a musket or rifle - then or now. 4) Accuracy today is far more dependent on the condition of the barrel after the intervening centuries than is velocity. One cannot assume that accuracy, particularly of rifled weapons, is the same today as it was when the weapon was first made. So all in all, the accuracy results are interesting, but far from definitive. At best, one can state the obvious: modern weapons are far more accurate than those of 3 or more centuries ago. Accuracy on single target is interesting to know, but far from what muskets were used for on the battlefield : against blocks and ranks of enemy infantry. Very interesting test, but inconclusive. What is a Saltpeter Man? What is a Cows Knee?